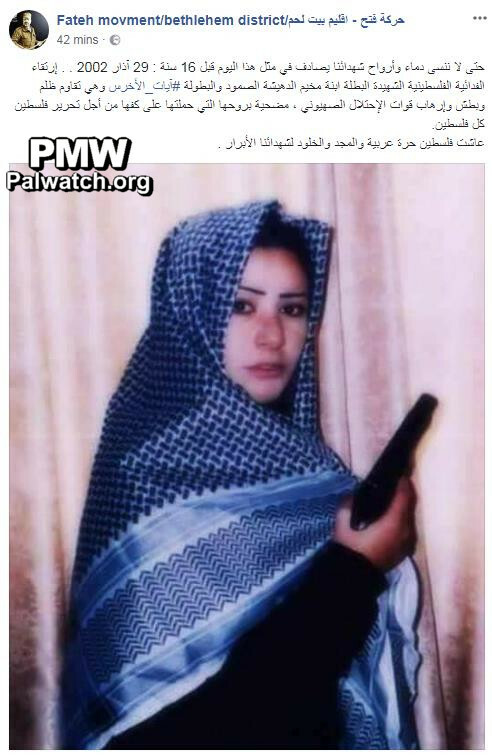 Fatah branch glorifies suicide bomber: "The Palestinian self-sacrificing fighter and heroic martyr… She sacrificed her soul… for the liberation of Palestine"
Posted text: "So that we will not forget the blood and souls of our Martyrs (Shahids): 16 years ago today, March 29, 2002, Ayyat Al-Akhras, the Palestinian self-sacrificing fighter (Fida'iya) and heroic martyr, a resident of the Deheisheh refugee camp… ascended [to Heaven] while resisting the oppression, brutality, and terror of the Zionist occupation forces. She sacrificed her soul, which she placed in her palm, for the liberation of Palestine – all of Palestine. Eternity and glory to our righteous Martyrs."